Recently we had dinner at our wonderful friends' house (hi Jake and Jessie! ), and of course I offered to bring dessert. When I'm making dessert for a group, I usually take a poll to find out whether people are chocolate or non-chocolate dessert people. Personally, I'm both, and I know there's a big gray area in there, but generally people instantly pick one or the other (almost always chocolate, in fact). Before I go on, I know you're wondering, so here are the 5: unsweetened, semisweet, milk, cocoa powder, and white. 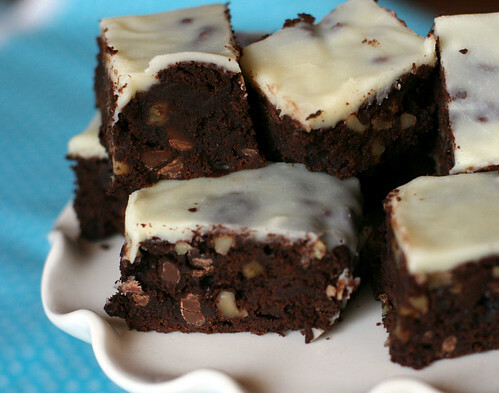 These brownies were so intense and dynamic and, well, chocolate-y. I think it's fair to say that I liked them as much as, if not more than, the infamous "Baked" Brownies I made last year. I almost didn't use the white chocolate glaze (even though I'm a white chocolate lover), since it wasn't completely smooth and was giving me a hard time, but I'm so glad I went ahead with it. The glaze, along with the chunks of walnuts and chocolate, added a textural dimension that went really well with the richness of the flavor. 1. Center a rack in the oven and preheat to 325F. Line a 9-inch square baking pan with foil, butter the foil and place the pan on a baking sheet. Sift together the flour, cocoa, and salt. 2. Set a heatproof bowl over a saucepan of simmering water and add, in the following order, the butter, the two chocolates, and the coffee. Keeping the pan over low heat, warm just until the butter and chocolates are melted. You don't want the ingredients to get so hot they separate, so keep an eye on the bowl. Stir gently, and when the mixture is smooth, set it aside for 5 minutes. 3. Using a whisk or rubber spatula, beat the sugar into the chocolate mixture. Don't beat too vigorously, you don't want to add air to the batter, and don't be concerned about any graininess. Next, stir in the eggs one at a time, followed by the vanilla. You should have a smooth, glossy batter. If you're not already using a rubber spatula, switch to one now and gently stir in the dry ingredients, mixing only until they are incorporated. Finally, stir in the milk chocolate chips and the nuts. Scrape the batter into the pan. 4. Bake for about 35 minutes, or until a thin knife inserted into the center comes out streaked but not thickly coated. Transfer the pan to a cooling rack and let the brownies rest undisturbed for at least 30 minutes (you can wait longer if you'd like). 5. Turn the brownies out onto a rack, peel away the foil and place in under another rack; it will be the drip catcher for the glaze. Invert the brownies onto the rack and let cool completely. 6. Put the white chocolate in a heatproof bowl. Bring the heavy cream to a boil and pour it over the chocolate. Wait 30 seconds, then, using a rubber spatula, gently stir until the chocolate is melted and the glaze is smooth. 7. Hold a long metal icing spatula in one hand and the bowl of glaze in the other. Pour the glaze onto the center of the brownies and use the spatula to nudge it evenly over the surface. Don't worry if it dribbles over the edges, you can trim them later (or not). Refrigerate the brownies for at least 20 minutes to dry the glaze. 8. Cut into 16 squares, roughly 2 1/4 inches on each side. Oh yuuuuuuumm!! These are gorgeous! !